What places make good woodpecker habitat? 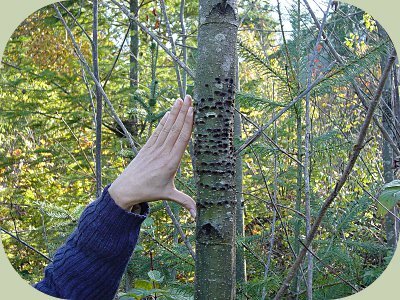 To answer that question, you have to look at what woodpeckers need to survive. This includes cover, nesting, and foraging habitat. Not all woodpecker species are made the same, nor have the same needs. There are a variety of woodpecker species and they can be divided roughly according to genus. All North American woodpeckers belong to the family Picidae. The members of the genus known as Colaptes are known as "flickers." Flickers are woodpeckers that spend much of their time foraging on the ground in relatively open areas. The members of the genus Sphyrapicus are known as "sapsuckers." 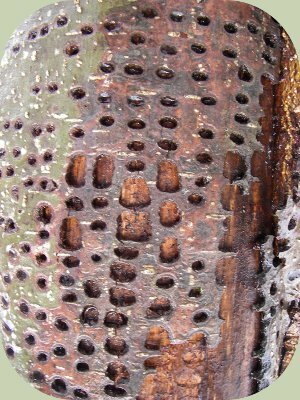 Sapsuckers feed on the sap of living trees, rather than on insects in dead or dying wood. The genus Dryocopus includes a very large woodpecker species, the pileated woodpecker. This crow-sized woodpecker is a shy denizen of older forests. The genus Campephilus includes the largest North American woodpecker, the ivory-billed woodpecker (Campephilus principalis). This species was believed to be extinct for several decades, but has recently been discovered alive in a swampy region of southeastern Arkansas. The genus Picoides includes a majority of woodpecker species, which are small to medium in size and tend to come in black and white plumage in various arrangements. The genus Melanerpes includes a motley of species such as acorn woodpeckers, Lewis's woodpecker, red-headed woodpecker, red-bellied woodpecker and Gila woodpecker. 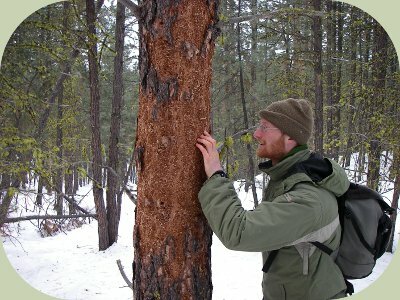 What makes good woodpecker habitat? 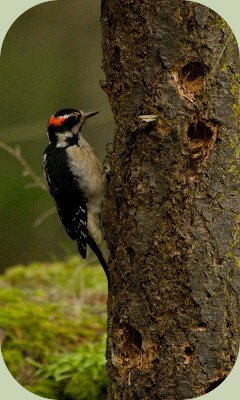 Woodpecker habitat generally includes trees and shrubs of various species, however, how each woodpecker utilizes those habitat features varies widely. Woodland edges, especially those adjacent to open areas are the favored habitat of northern flicker (Colaptes auratus). These woodpeckers are ground feeders that eat mainly ants. Oak woodlands along the Pacific coast and in the southwest US are the preferred habitat of the acorn woodpecker (Melanerpes fomicivorus). This species stores acorn crops in the bark of trees or even wooden poles. In riparian woodlands throughout most of the US you can find the smallest woodpecker in the country, the downy woodpecker (Picoides pubescens). It forages on the twigs, small branches of trees and stems of large weeds and shrubs. Although it can be found in similar habitats, the hairy woodpecker (Picoides villosus) tends to favor the larger, more mature forested area. Hairy woodpeckers favor foraging on the major branches and trunks of trees. They are also known for flaking of bark on trees to seek insects underneath. Spruce forests with many dead trees and burned areas are home to the three-toed woodpecker (Picoides tridactylus) and black-backed woodpecker (Picoides arcticus). These species do what is called "bark sloughing," which means removing layers of dead bark from the trunks or branches of dead trees. In the photo below you can see the horizontal lines left by the woodpecker's beak as it pried under the bark on this dead pine tree. Mature, swampy bottomland forests in southeastern Arkanses are the unique home of the ivory-billed woodpecker (Campephilus principalis). It feeds on insect larva by peeling the bark from recently dead or dying trees. Mature hardwood and coniferous forests are the preferred woodpecker habitat for the pileated woodpecker (Dryocopus pileatus). Its favorite food is carpenter ants, and it leaves distinctly large, rectangular to oval shaped holes in the side of snags and fallen logs. Examples of these rectangular holes can be seen in the photo below. Mixed woodlands and mixed forests throughout the US are home to one of these 4 species of sapsuckers: yellow-bellied sapsucker (Sphyrapicus varius), Williamsons's sapsucker (Sphyrapicus thyroideus), red-naped sapsucker (Sphyrapicus nuchalis) and red-breasted sapsucker (Sphyrapicus ruber). 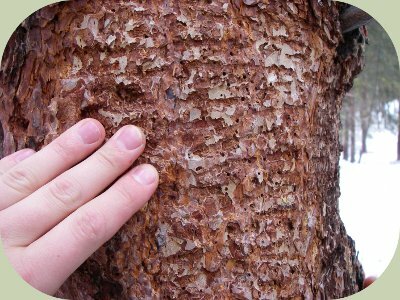 Sapsuckers feed on the sap of living trees, by making wells in their bark and lapping up the weeping liquid and the insects attracted to it. 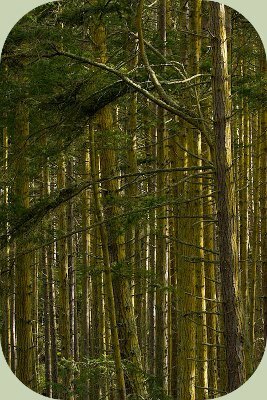 They leave distinct rows of circular or rectangular wells in various tree species. Here is a close-up example of a set of sapsucker wells. Learning to recognize and understand woodpecker habitat will give you a greater appreciation for these amazing birds and the places they live. All woodpecker species are tied to forests, woodlands and shrublands for their food, shelter, and nesting needs. The more you study them, the more you will find the need to learn about all the other organisms they are in relationship with. For intensive training in naturalist knowledge, check out the Alderleaf Wilderrness Certification Program.